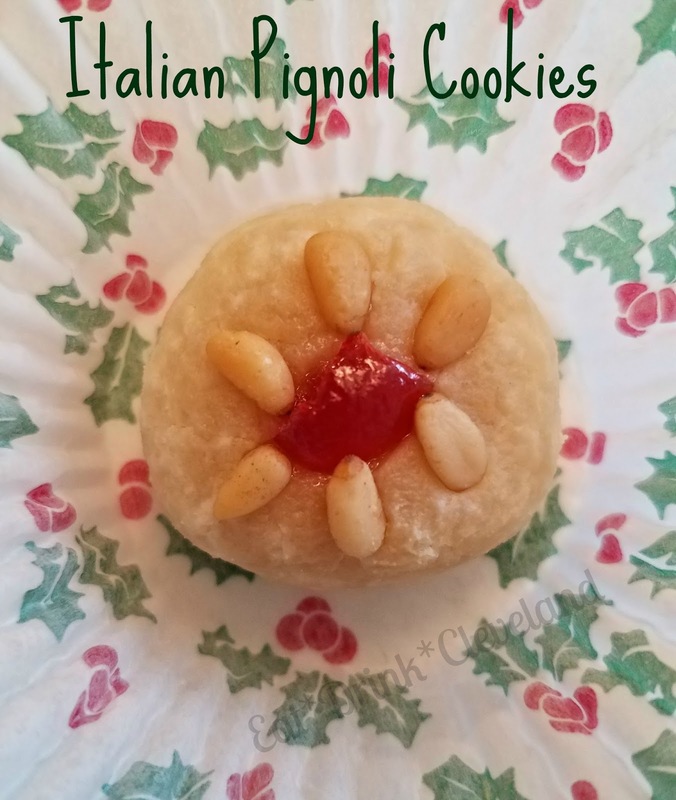 One of my favorite cookies is an Italian almond paste cookie called Pignoli. Normally served at the holidays or other special occasions, they are always the first to disappear. The thing I love most about them besides the decadent almond flavor is the texture - they are SO chewy. This year was my first year attempting them. I don't know why but they always seemed so mysterious. How could a block of almond paste transform into these light, chewy morsels of heaven? You may have seen almond paste at the store and wondered what the heck it is. It's what makes these cookies so chewy. For this recipe, make sure you use this and not marzipan or pie filling, they will not work. It comes in boxes and cans. I personally like the little boxes better because it's easier to open but either are fine. I tried a couple different recipes and finally found a winner! This one doesn't use any flour so it's gluten free too. Bust out your food processor to make these even easier. If you don't have one, you can crumble the paste manually and use a pastry cutter. This recipe is expensive but so worth it! You will need parchment paper or a silpat for this recipe. Break up almond paste to fit into bowl of food processor. Pulse almond paste until crumbled up into small bits, then add confectioners sugar and salt and continue to pulse until very finely ground, about 1 minute. Beat together almond mixture, egg whites, and honey in mixer at medium-high speed until smooth, about 5 minutes. The dough will be very thick. Refrigerate over night. Bake cookies until golden, approximately 10 - 12 minutes depending on the size. Slide cookies on parchment onto racks to cool completely, then peel cookies from parchment. Make rest of batch on cooled baking sheets. 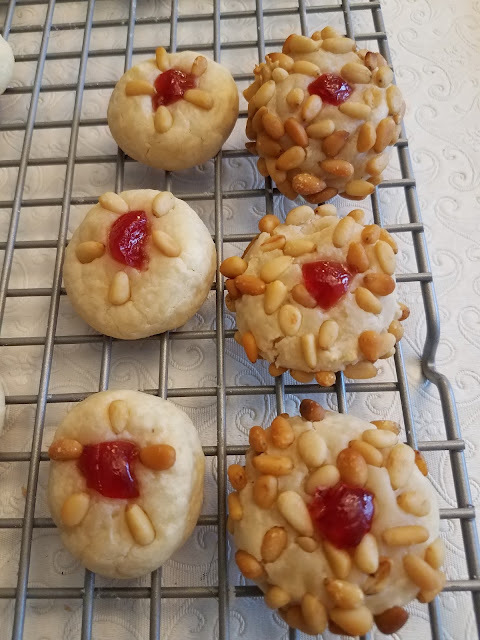 If you roll the cookies in the pine nuts you will need at least 2 cups of the nuts. 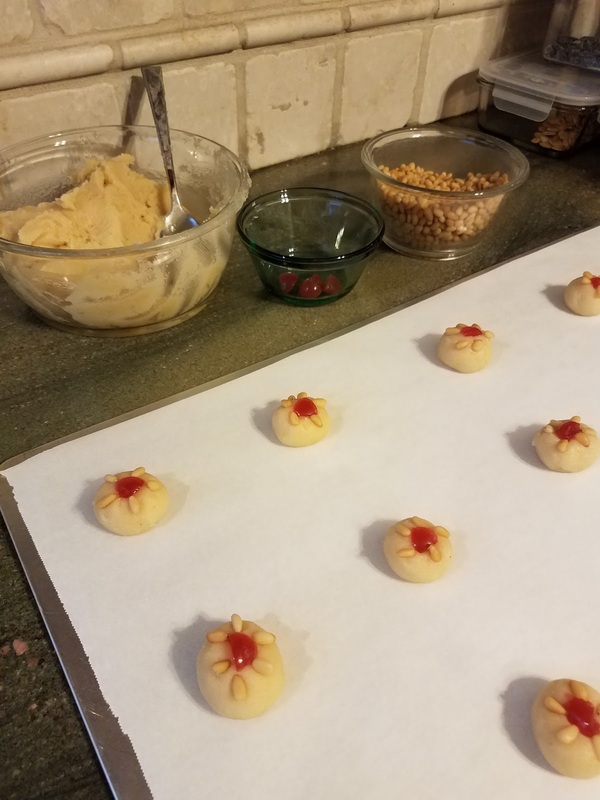 Cookies will keep, layered between sheets of wax paper or parchment, in an airtight container at room temperature 1 week or they can be frozen. Guys, can you believe there are only 13 days until Christmas? This whole year has just flown by and it's picking up speed as we finish it up. It was filled with a family Christmas party, breakfast with Santa, our annual mall shopping, fancy cocktails, delicious food and live music with lots of dancing. If you are still shopping (me too! 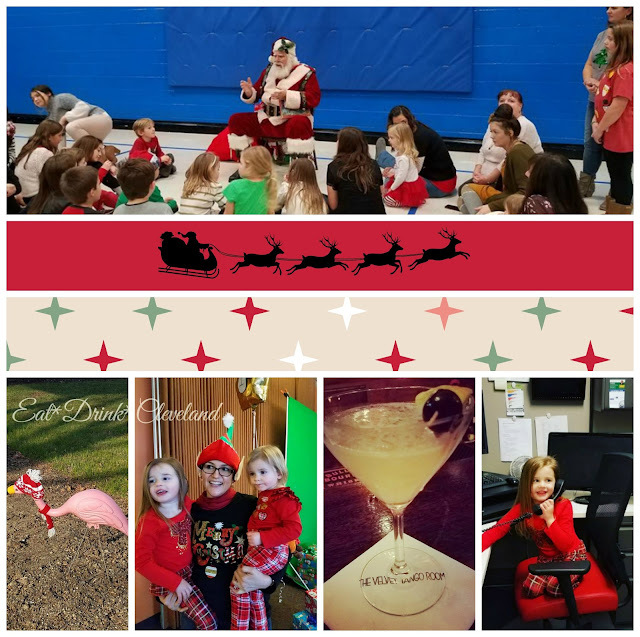 ), check out my Gift Guides for Foodies, Wine Lovers, Kids and Buckeyes or daily deals on Facebook for some ideas. 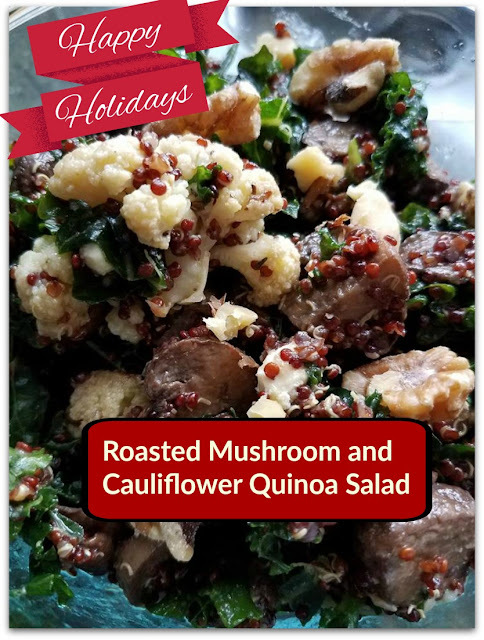 If you are looking for a healthy, festive and delicioius recipe to take to a party, look no further! We made this for the family Chistmas party this weekend and it was the hit of the party. It's vegetarian, vegan, gluten-free and really easy to make. Soooo many people requested the recipe after the party, I thought I should share with my fabulous readers too. You're going to want to make this. This recipe is SUPER easy and the best part is that you can easily customize it and the measurements don't have to be exact. If you hate mushrooms, leave them out! Love them, add more. Toss in some chickpeas if you're in the mood. Add some chicken. Swap the walnuts for pinenuts or cashews. Allergic to nuts, skip them all together. See how easy that is? Preheat oven to 400 degrees. Toss cauliflower florets with olive oil, salt, pepper garlic and half of the thyme. Place in shallow baking pan. Do the same with the mushrooms but put them in a separate pan. Roast veggies, stirring occassionally. The mushrooms will release a lot of liquid so you will need to drain them part way though so they don't end up simmering. We save the liquid - it's so good and great to add to soup, when cooking rice, etc. The mushrooms will take about 20 minutes, the cauliflower will take a little longer. When it is tender but still firm, it's done. Don't cook until soft and mushy or you'll end up with a mess. While the veggies are roasting, drizzle olive oil on the chopped kale. Just a little bit is needed, maybe a teaspoon or two. Massage the kale to soften it and ensure the olive coats all the leaves. Place in a huge bowl. 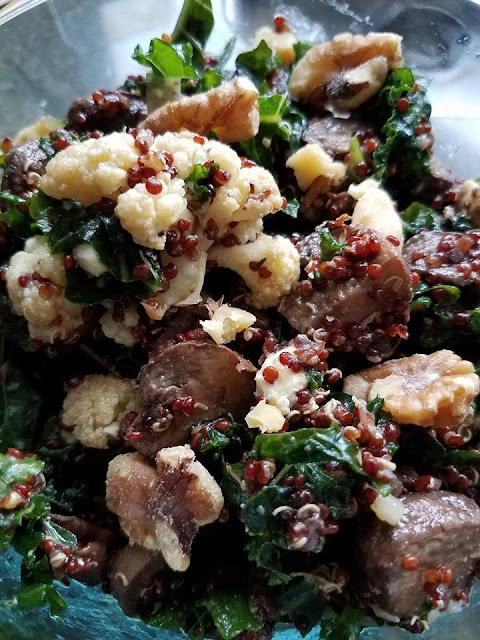 Add cooked quinoa to the bowl of kale. Toss very well until the quinoa is evenly distributed. Add roasted veggies. 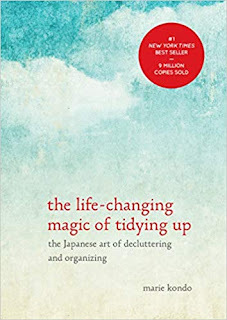 Toss again. Add cheese and a generous dizzle of the balsamic glaze and toss yet again. Adjust seasoning if needed. Place in serving bowl and garnish with the green onions, walnuts and another drizzle of the glaze. If your "fancy" mushrooms are small, don't add them at first. Stir them in after you drain the liquid. This will keep them from over cooking. Use lacinato kale instead of the curly kind and you can skip the massaging. Just toss lightly with the olive oil and move to the next step. Try regular quinoa or a pretty blend like this one. I picked red because of the holiday but the blends are my normal go to.